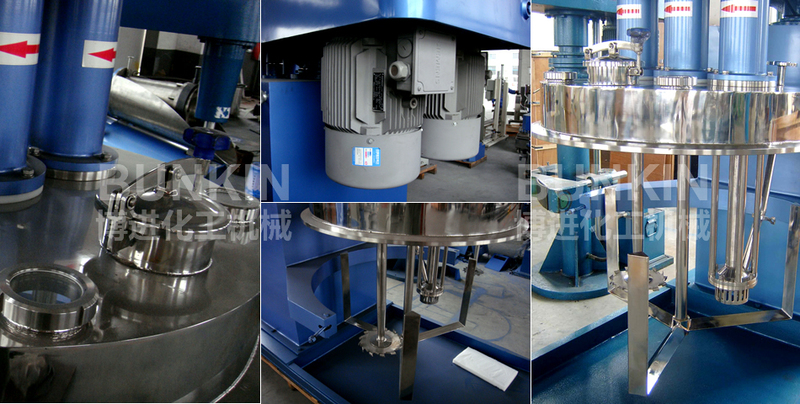 Tri-Shafts multi-functional Mixer_Anhui Bunkin Chemical Machinery Co.,LTD. Multi-functional mixer, with the function of dispersing, emulsifying, stirring and mixing. It has good adaptability of high viscosity and thixotropy material. Various optional mixing ways, conventional such as anchor, butterfly, frame, etc. It has so strong adaptability, emulsion, dispersion and mixing can be simultaneously realized, and can be customized by the different requirement of materials characteristic and production process of the customer. Mixing agitator driven by the power unit rotates in a fixed direction, which makes the materials rotate in axial and radial direction; And the materials inside the tank, at the same time, also do axial and circular motion. So materials can be mixed and blended properly with high efficiency. Through the high speed rotation disc, the materials flow in a annular form resulting in strong vortex. The vortex spiral materials down to the bottom of the vortex. The intensive shearing, crashing and friction force generated between the particles disperse, dissolve and mix materials efficiently. The stirring disc, through the circular motion, produces a good radial function, which accelerate the material circulation and improve the efficiency of dispersing. It consists of the agitator with scraper and two sets of high(middle)speed dispersing and emulsifying, the three sets of agitators working at the same time to have the materials mixed rapidly under the cation of strong shearing and kneading force. Adopt hydraulic cylinder as lifting actuators. 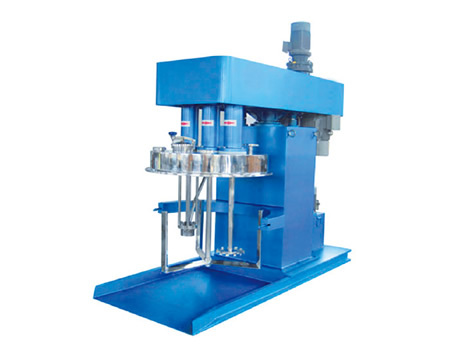 Control the mixing up, stop, and down though controlling the valve, simple operation and high stability. With bolt fixing the agitator and the main shaft, easy to disassemble and clean, different clamping model(belt clamping, manual rotation clamping, pneumatic clamping) , can fix the mixing tank rapidly to prevent any possible accident due to tank displacement. The device has compact structure, can be designed to floor type and platform type, the tank can be designed with removable and fixed type. Different options are available such as explosion-proof type, closed type, with lifting cover type, co-axial/dual shaft compound, multi-tanks, mounted on kettle type, etc. Material can be customized to be SS304\SS321\SS316.